An ankle sprain is an injury to one or more ligaments in the ankle, usually on the outside. Ligaments are bands of tissue that connect one bone to another and bind the joints together. In the ankle joint, ligaments provide stability by limiting side-to-side movement, controlling excessive movement of the joint. When an ankle sprain happens, the ligament is stretched too far, and is either partially or completely torn. In this last case, the condition is not a sprain but a rupture, needing the patient to perform a surgery to repair the torned ligament. Nevertheless, physical therapy treatment is still needed after surgery. Sprained ankles often result from fall, a sudden twist or a blow that forces the ankle joint out of its normal position. These commonly occur while participating in sports, wearing inappropriate shoes, or walking or running on an uneven surface, and can occur during athletic events or during everyday activities (McMurray, T.B., Orth, M.C. (2008): more than 23000 ankle sprains are estimated to occur each day in the U.S (Kannus, P., Renstrom, P., 1991). Even more concerning is the large percentage, 70%, of patients who have repetitive ankle sprains and chronic symptoms after the initial injury. The development of repetitive ankle sprains and persistent symptoms after injury has been termed chronic ankle instability (CAI) (Hertel, J., 2002). CAI not only limits physical activity but can also lead to articular degeneration of the ankle joint and an increase risk of osteoarthritis (Harrington, K.D., 1979). Hubbard et al (2007) reported that mechanical laxity was the largest predictor of the development of CAI. This mechanical laxity may be present because of incomplete healing of the ankle ligaments. The Inversion Ankle Sprains are the most common type of ankle sprain and occur when the foot is inverted, falling inward. When this type of ankle sprain happens, the outer, or lateral, ligaments are stretched too far. 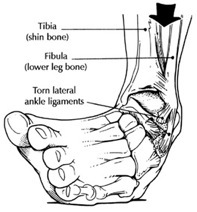 There are three ligaments that attach to the outer side of the ankle. About 90% of ankle sprains are inversion injuries. Pain is always on the outside of the ankle, and there is usually no pain on the inside of the ankle joint. The other type of sprained ankle is called an eversion injury, where the foot is twisted outwards. When this occurs, the inner ligament, called the deltoid ligament, is stretched too far. Patients will have pain on the inner side of the ankle. The high-ankle sprain, which is known in medical terminology as an interosseous ligament sprain or a syndesmosis sprain of the ankle, usually results when one’s foot is turned out and a strong, sudden outside force causes the foot to turn out at the ankle with an external rotation force. This may cause a disruption in the ligaments which hold the two ankle bones together and also a tearing of the interosseous membrane, which runs up the leg between the two bones. Different from the common ankle sprain, where pain is felt on the outside of the ankle, the pain, swelling, and discomfort of the high-ankle sprain occur in the area just above the ankle and between the two bones and may run as high as six inches above the ankle. As one tries to bear weight, it causes the force to spread the bones apart. Usually, the injured athlete is unable to immediately bear weight (Lucie, R.S., 1998). Common symptoms associated with an ankle sprain are pain with swelling and bruising. The degree of symptoms tends to correlate well with the extent of the damage to these ligaments.